Right now, the House is working on its version (HR 1010) of the Fair Minimum Wage Act of 2013, an incredibly important piece of legislation that will raise the minimum wage from $7.25 to $10.10 in three steps and then index it for inflation henceforth. Raising the minimum wage to $10.10 per hour would help over 30 million Americans by boosting their paychecks and giving them the ability to spend during the holidays…thus contributing to and growing our continually-weak economy. But will they REALLY help the economy? Think about it for a minute. Low-income people don’t save their money. They use it in order to get by and provide for their families. They don’t hide their money in off-shore accounts in the Caymans to avoid taxation. They don’t put their money in safe deposit box for a gloomy day. What DO they do? Why, they spend it. 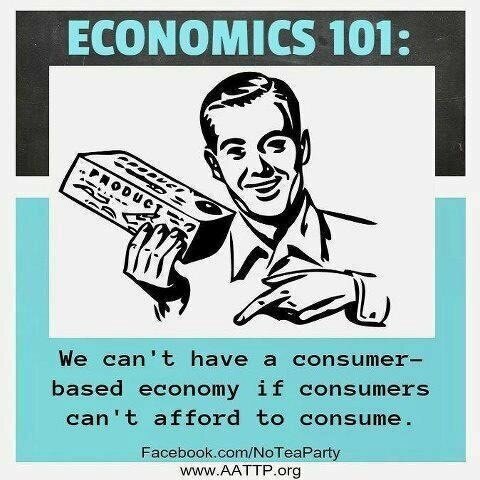 They contribute to the consumer-based economy by purchasing. And in doing so, they create the need for the more products and new jobs. Call Congress and let them know that you want the Fair Minimum Wage Act of 2013 to pass – and that supporting HR 1010 is incremental to that success. Remind them that our workers need a living wage – so that they can spend, and so that our economy can prosper. Show your support. Today is October 10th… that’s also 10/10. The bill number in the House is HR 1010. Don’t you think it’s far past #Timefor1010? For much more detail on the minimum wage, look for my new Everyday Feminism article on the minimum wage, coming out later this week!